While truffles are usually found completely underground, occasionally they break the soil surface. We have had a long-term interest in wild food and foraging, starting in childhood with finding edible crabs and lobsters on the Gower coast. More recently, regular requests to take people foraging lead to our first course in Spring 2008. This sold out in no time and more were added to meet demand. We have now been running a range of foraging courses regularly since this time through Hedgerow Harvest. Following redundancy in 2008, we went on a truffle hunting course with one of our dogs. She took to it like a 'duck to water' and was invited to take part in the first UK Truffle Hunting Championships. After a lot of practice she won the title, a trophy and, most important to her, a lot of dog food! Since this time, we have trained three more of our dogs to find truffles. 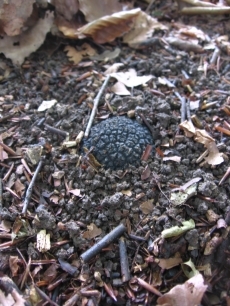 Since 2008, we have found significant quantities of truffles from woodland sites across southern England. These have been sold to Michelin star and leading restaurants, private individuals, wholesalers and truffle retailers. At the English Truffle Company we wish to continue harvesting truffles from our sites for many years to come and so work in a responsible, sustainable manner. Since 2011 we have run unique truffle hunting experience days in Dorset, Wiltshire and Hampshire from October to January. Besides selling truffles, truffle trees, truffle shavers and truffle products (oil, salt, gifts etc.) we are regularly invited by private landowners to search for truffles in their woodlands or harvest truffles from their plantations. We also run truffle dog training workshops around the country.